A First-Aid Guide For New Parents — Get CPR Done! Nationwide CPR Training. Low Cost. High Engagement. First and foremost, congratulations! You’re a new parent. If you’re not excelling at everything for the entirety of your child’s life, do better! (Just kidding) Our first aid guide for new parents will ease at least some of the worries racing through your mind and give you the confidence you need to tackle any mishaps. Here's how to keep your bundle of joy safe and healthy. You and your baby are extremely photogenic. It's a great idea to take a CPR course in order to learn about the proper methods to perform CPR on infants and young children. Because infants are so small and some of their organs are not fully developed, they will need CPR that's adjusted for their smaller frames. Instead of doing chest compressions with the heel of your hand, use two fingers. The American Red Cross suggests that before performing CPR, you check the baby’s responsiveness by tapping the baby on the bottom of the foot. If there is no response, and you are by yourself, administer a few minutes of CPR before calling 911. However, if there is a bystander, ask him/her to call 911 as you begin CPR. If your child is unresponsive to the foot tap, follow these next steps. First, lay the child on their back, move the head backward, and lift the chin up. Check for breathing. If the baby is not breathing, administer two rescue breaths. To deliver a rescue breath, seal your mouth over the infant's mouth and nose and blow for about one second or until the chest rises. Do 30 quick compressions about 1.5 inches deep with two fingers, then, administer two rescue breaths. Repeat this process until you see signs of life. For young children who are older than infants, the Red Cross suggests a very similar course of action. This time, pinch the nose and seal your mouth over your child’s mouth, giving breath into the mouth twice. Then, perform compressions. Place the heel of one hand of the center of the chest, lay another hand on top of that one, and cross fingers together. Provide 30 quick compressions about 2 inches deep, and, then administer two rescue breaths. Always have a fully-stocked first aid kit prepared. A baby’s first aid kit should have tools to deal with cuts, splinters, pain, and just about everything else. Here's the list of essentials. For pain and fevers: thermometers, Tylenol (for infants), and Orajel for any teething aches. An ice pack can be used for any swelling or bug bites. 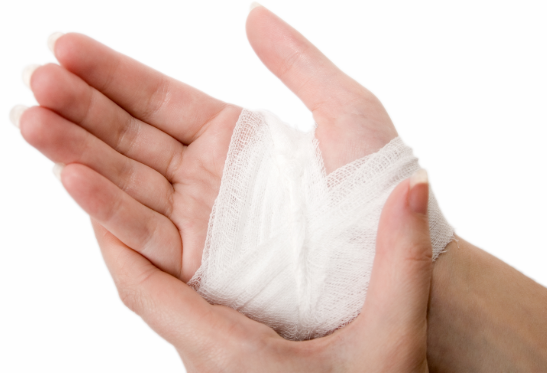 Bandages, gauze pads, antiseptic sprays, and ointments are good for cuts. Diaper rash ointment, anti-itch cream, and Benadryl, for any allergies, can also help alleviate bug bites and rashes. For runny noses, saline wipes help to clean and lock in moisture. Additionally, nose and ear tools can be used to clean either area. For stomach issues, gas relief drops or gripe water can provide relief. For wounds, apply firm pressure to a sterile gauze onto the injury, and raise the infant’s lower body to increase blood flow to the heart and brain. For nosebleeds, pinch the tip of the nose and apply slight pressure for a few minutes, checking periodically to see if the bleeding has stopped. If the nosebleed continues after about ten minutes or in cases of very severe bleeding, call 911. If your baby is sweating and has hot skin, he or she may have a fever. Take off the baby’s clothes to cool them off and check for their temperature. If their oral temperature is above 100 degrees, consider calling your doctor. To clean wounds, sanitize the hands with soap and water. Then, disinfect the area with alcohol, apply antibacterial ointment, and bandage the area. This is not an infant or small child's hand being treated for a burn. Our photo department apologizes. Burns are some of the most common childhood injuries (stop reaching for that!) Best treatment practices range depending on the severity of the burn. First degree burns only affect the top layer of skin. These burns typically produce swelling, pain, redness, and blisters. It may take about three days to one week to heal. For these burns, use cold water and, if possible, aloe cream on the affected area. No other ointments or prescriptions should be applied. Then, apply a gauze pad over the area to ensure it remains clean. Second-degree burns involve the layers beneath the top layer and are more severe. They also produce blisters, severe pain, and redness. Cover the affected area with a soft, clean towel. Third-degree burns affect all the layers of the skin as well as underlying and surrounding tissues. The surface of the skin appears waxy and dry. There may be no pain, and the area can feel numb initially. These burns are treated with skin-grafts, which involves taking healthy skin from another part of the body and placing it over the injury to help the wound heal. For serious second- and third-degree burns seek medical assistance. Give the child ibuprofen for pain as needed. Here are some of the situations where burns may occur, with specific treatment protocols. Although food accounts for most choking episodes, tiny objects such as coins, balloons, and other small toys can also be hazardous. If your baby is coughing or crying, do not perform anti-choking procedures, and instead wait for your child to push the object out or remove it from your baby’s mouth. If there is no coughing or crying, follow choking procedures. When an infant begins choking, place the infant on your arms with their back facing towards you. Deliver five back blows with the heel of your hand between the shoulder blades. Then, turn the baby over with their chest facing toward you, and give five chest thrusts by placing two fingers in the middle of the baby’s chest and pressing down and releasing quickly. Repeat this until the item is removed or the baby goes limp. If the baby goes limp, jump into infant CPR. To prevent against any accidental injuries, try baby-proofing your home. For any other severe injuries, call 911 immediately. Check out our other articles on our resources page!